There are certain scents that arouse the senses, bringing forth an amorous mood that is perfect for Valentine’s Day romance. But how do you concoct just the right romantic love potion or aromatherapy recipe for the love of your life? Here we demystify love potions and aromatherapy, providing tried-and-true combinations for you, beginning with an article by Paula Polman, a Canadian expert in aromatherapy and herbal therapy. Actual formulas are not given as part of the power of a potion lies with the creator of the blend. 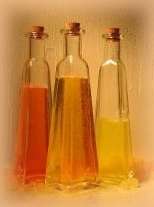 The oils are listed in terms of what portion of the blend they form: MA=major, mi=minor, T=trace. If there is an asterik (*) after the oil, that indicates the oil is a possible irritant and should be used with caution. – Ylang Ylang (MA), Jasmine (MA), Champa (mi), Tuberose (mi), White Wine (mi). For this one, place a few drops of this on your lover’s and your heart to bind them in your mutual love for eternity. 1/2 cup sweet almond oil and 1/2 teaspoon of essential oil. Shake the bottle before using. Fragrant tender perennial herb producing a oil used in perfumery. Patchouli leaves emit an exotic incense. Grows to about 12 inches in sun to part shade. Through the ages we have been fascinated with the idea of love potions. A magic elixar that creates instant love or passion. Does Love Potion #9 really exist? We know that scent plays a major role in the art of passion. We also know that essential oils can have noticeable effects on our moods and physical responses. Are essential oil blends the answer? Well, science has been unable to provide any concrete answers, however, do any digging through folklore medicine references and you will certainly find all kinds of herbal suggestions and talisman ideas. Herbs have been used to enhance romance for centuries, by lovers and lovelorn alike. Among the herbs said to promote the course of true love is basil. Offer a sprig of basil to the man of your dreams and, if he accepts it, he is surely yours. Tudor maidens who wished to marry would place a bay leaf beneath their pillow on Valentine’s Day and whisper the couplet, “Saint Valentine, be kind to me, In my dreams, let me true love see.” If they then dreamed of love, it was surely a prediction that they would marry within a year. Gentlemen should put a pinch of dried sage under their tongue before approaching their intended to ensure a love-swept courtship. They should also remember that many herbs are reputed to have aphrodisiac qualities; among them are sweet basil, thyme, rosemary, juniper, laurel, myrtle, sandlewood, patchouli, elderflower and jasmine. If you’re feeling insecure in love, then tying three laurel leaves to the bottom of your bed will ensure that your lover sees no-one but you. Take a lock of your lover’s hair and mix it with the burned ashes from a small piece of your lover’s clothing. Wrap in a white hankerchief with a handful of johnny-jump-ups (also known as heartsease). Bury the hankerchief under your porch at the new moon. Your love will be true to only you – but only for one month. For long-term fidelity, share the leaves of the periwinkle with your husband, or plant marigolds in the soil upon which your loved one has walked. He will be faithful to you forever. For friendship, make two small red silk bags, fill with cloves and tie with ribbon. Wear one silk bag yourself and give the other to your friend. You are sure to be friends forever!